My love for vintage stuff is never ending, I collect antiques whenever I get a chance, like international coins & currency, mail stamps and some other random things like this. 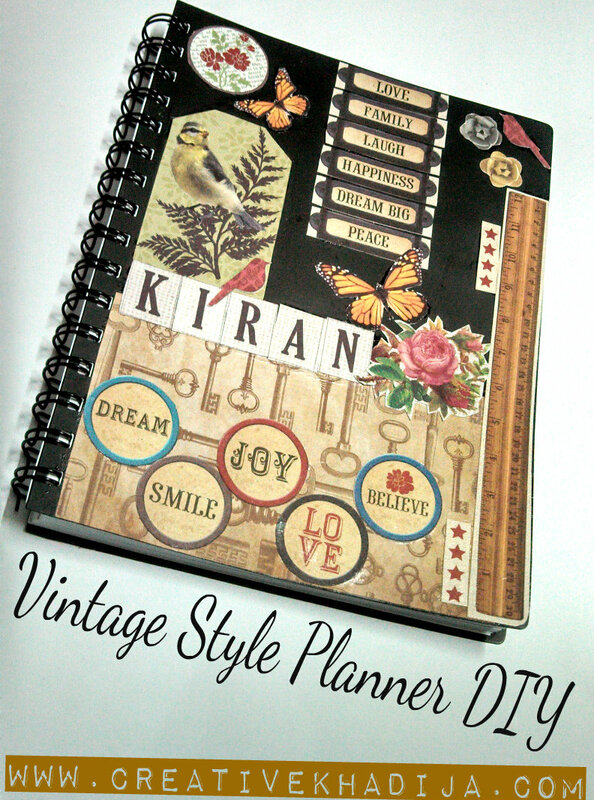 I design my business planner/dairy cover while keeping the vintage theme in my mind. 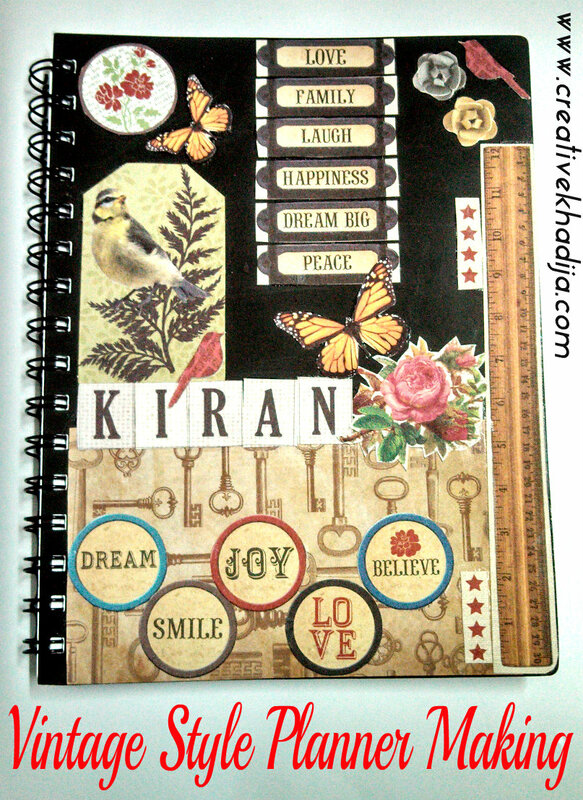 So here today I am going to share a planner cover designing with some podgeable papers & scrapbook sheets which I have got from USA once. This planner is mostly near me during most of my working day. Sometimes I am writing my business plans & schedules on it & sometimes my upcoming crafty ideas..oh yeah in a separate side, I also write some yummy recipes which I note from my favorite food blogs & TV channels as well..well this is kind of “all in one” planner.. I love holding it and making random drawings on it. 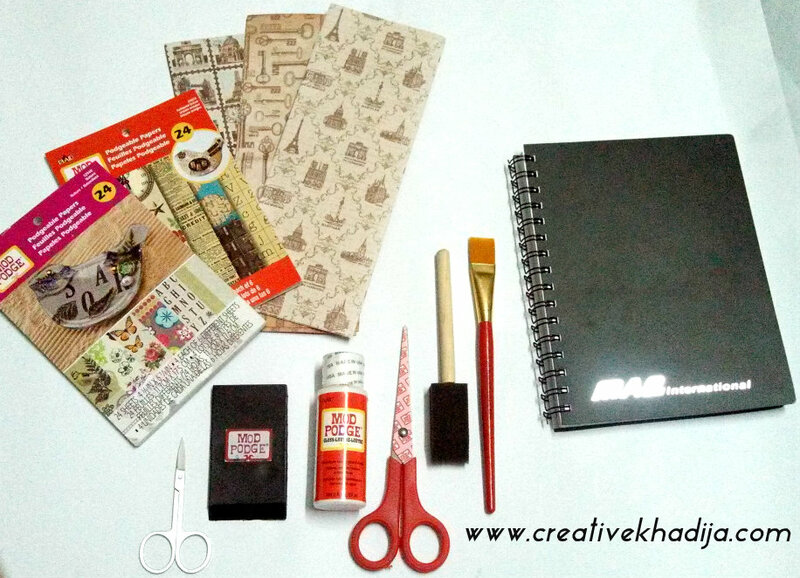 This planner was plain black & I was happy with its plain plastic cover sheet, my eldest brother gifted me this planner once & He suggest me to do something crafty. but its been long the diary was still plain, my bro saw this once & ask..”Hey why don’t you design it, where the “Creative Mind” these days? ?” ahem ahem..so it was kinda teaser by him..ahan! SO I THOUGHT TO DO SOMETHING…FINALLY!! haha..
Fall is here and everyday I love seeing brown crispy dry leaves in my yard, I have saved a few pretty shapes as well, These weather changes are always interesting in their own way!I were already inspired by vintage and fall so here the theme goes for this crafty creation..Have a look what I have done & how! A close up image.. this is SandalWood hand carved pen, also among my antique treasures! the Sandalwood fragrance is still here from years, its with me from more than 12 years back. Here is my favorite scrapbook pages & books which are filled with pretty designs and things..Remember Amy sent these once! My iPad and my Planner are my most helping partners. 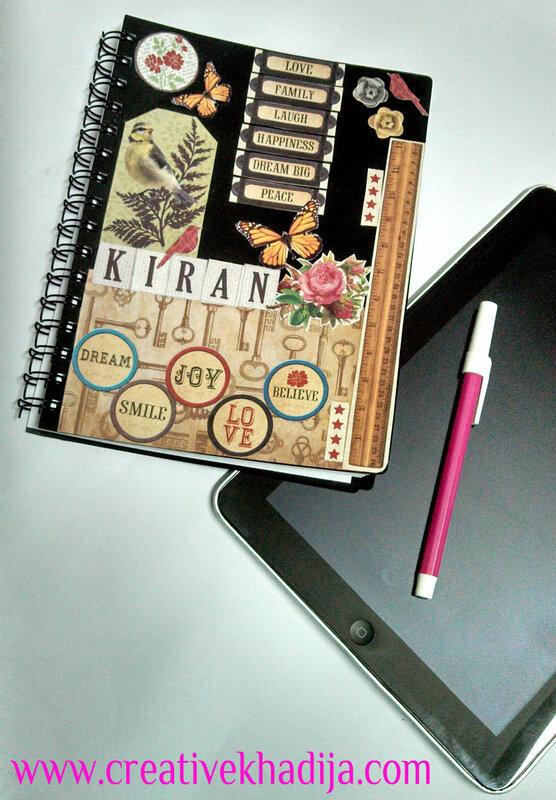 I design planner with Kiran name, You may know well who is KIRAN..? oh yeah its ME definitely! 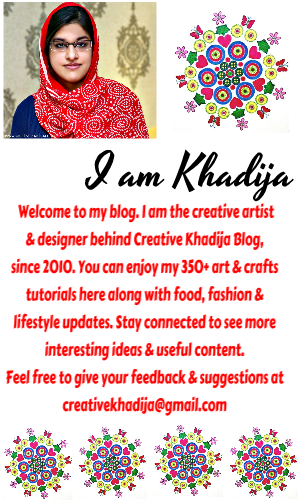 in my family nobody call me by saying Khadija..even no one is much familiar with my Khadija name, So I design it with KIRAN name. I don’t wanna offend people who will may be asking whenever they will see Khadija name anywhere..haha. isn’t it looking well? 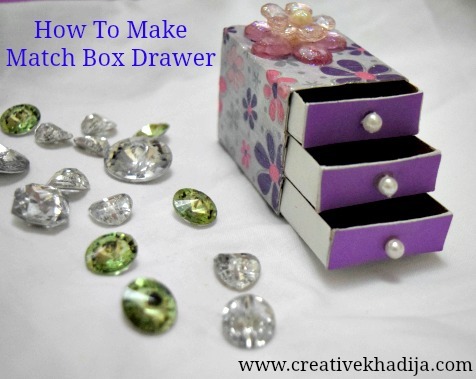 see the Tutorial now! 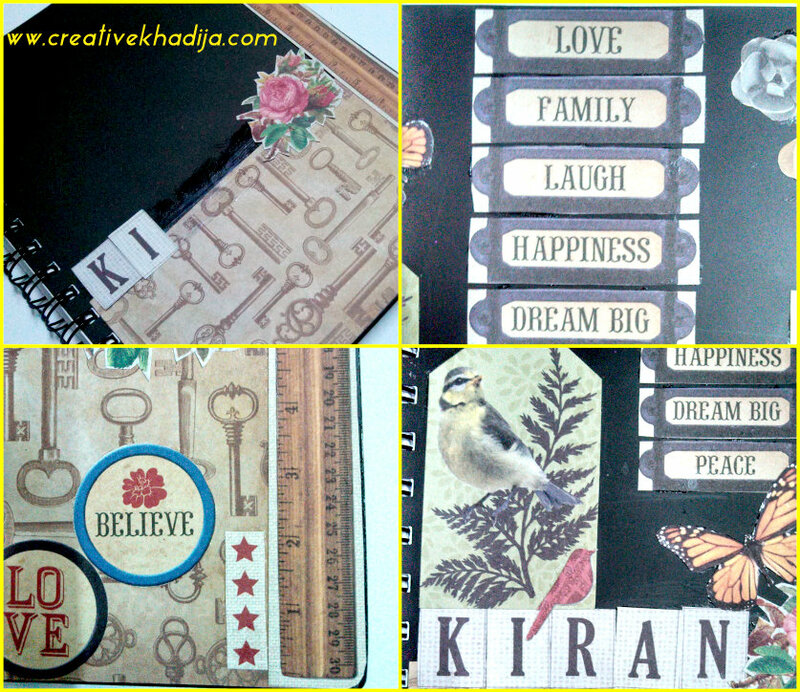 The most interesting and favorite thing is the words I cut from the scrapbook, Love, Family, Laugh, Happiness, Smile, Dream, Joy, Believe.. and this is how I live..My life is all about these words..
At first I apply the bigger paper sheet at front bottom, Then I set my name’s cuttings..the little motifs of birds and butterflies.. These wonderful words & the message inside is so much to me..
My Life is all about these things..Love-Family-Laugh-Happiness-Dream Big-Peace. isn’t it a perfect message for a perfect life? That’s it.. I paste all the cuttings and then mod podge it..it was looking fine! I also want to try glitter but that wasn’t going well with this vintage look. 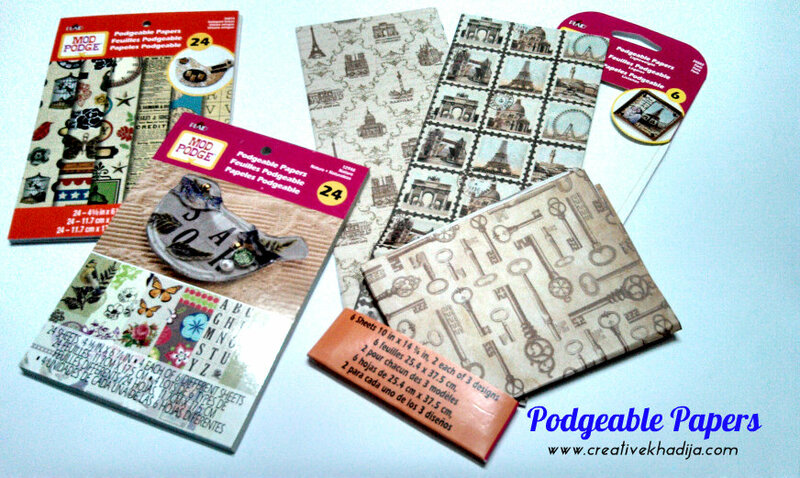 Decoupage is the best craft for today! I hope you will like the way I design it.. now I enjoy more while holding this in my hand everyday. If you want to make it more long lasting, you can also did a plastic wrap covering by electric machine, but I like my planner the way it is..whenever I touch it..it makes me feel good..the pieces of papers can may be ordinary for others but they are extraordinary for me! 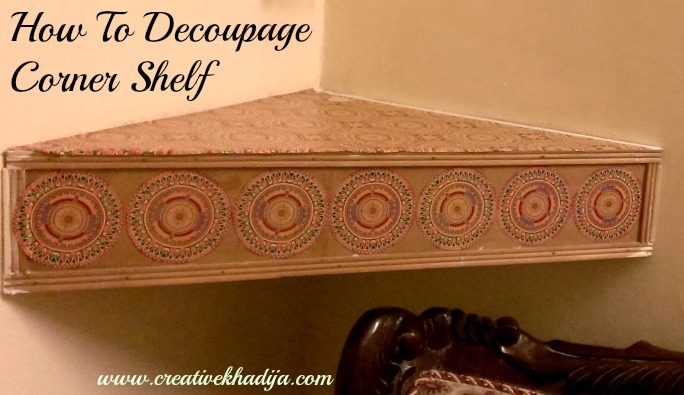 You can see my previous Decoupage Projects.. The post is getting long! Believe me I am talkative, but mostly when I am happy I talk some more. So did you got my message? see above on planner cover and adopt any 1 among all of those! I bet you will be happy to get it. It’s so fun and cool! 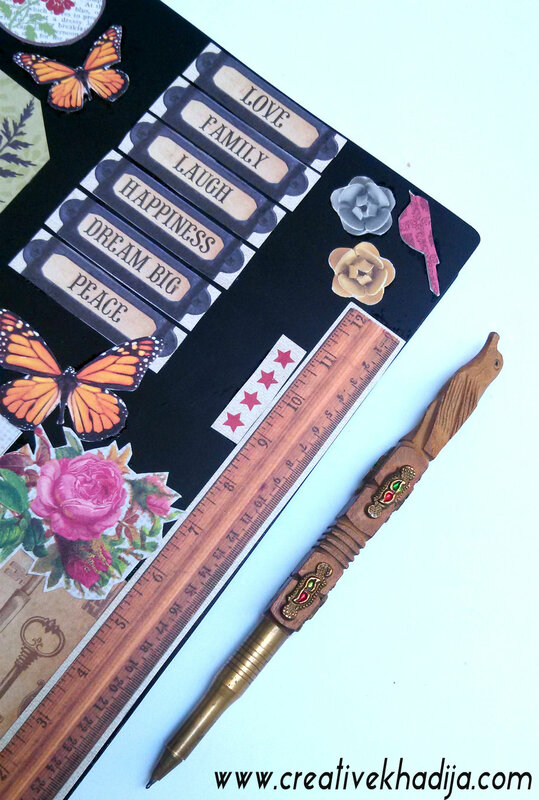 I especially love the ruler on the edge – what a great idea to make it useful for measuring stuff at any moment! The planner looks great. The layout is terrific. It is interesting without being overwhelming. Yeah, I fix the ruler cutting near the edge just because if I need to measure something it will may be helping, but its size it not exact. Thanks Mich ! 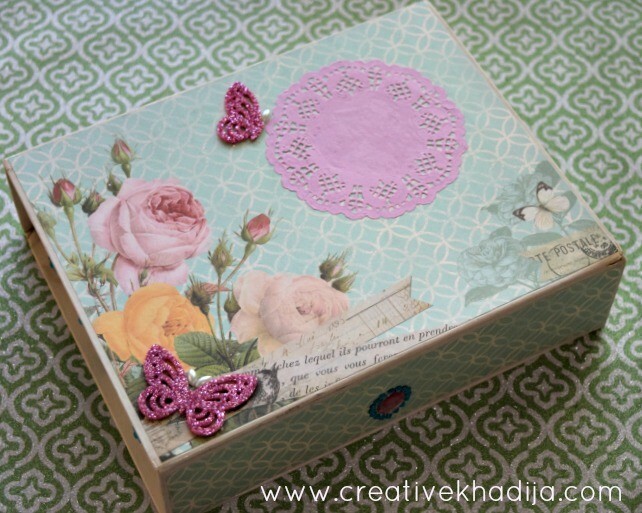 Thank you for stopping by and sharing photos of your project at the weekly photo linky. We keep the focus on wordless posts of original photography. Thank you Image-in-ing. all the best. Very nice, I love your cover. 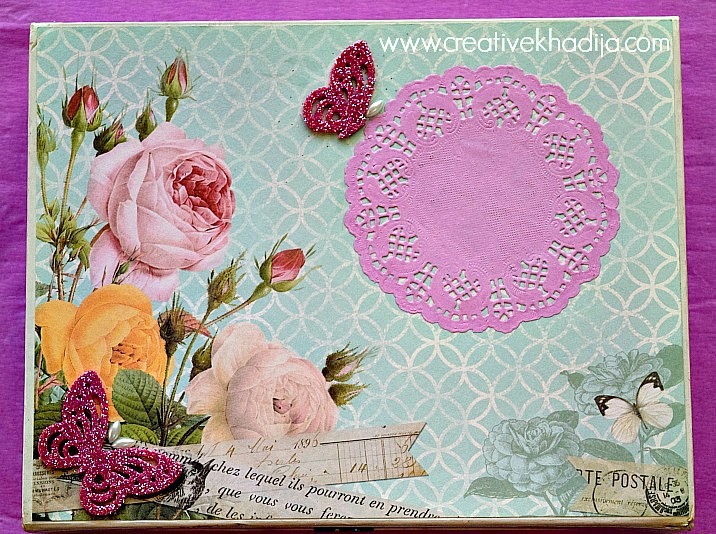 This journal is gorgeous! You did a wonderful job and I love your tutorial! Thank you so much dear. Happy fall..
WOw.. that is so cool! I just get the plain old kind at dollar store, but I think for next year, I will create one like yours! I used to scrapbook so I have tons of embellishments to use! Thanks for the inspiration! Oh this is lovely and truly personalized now. I bet it warms up your heart a bit, whenever you glance at it :-) And the gorgeous pen! 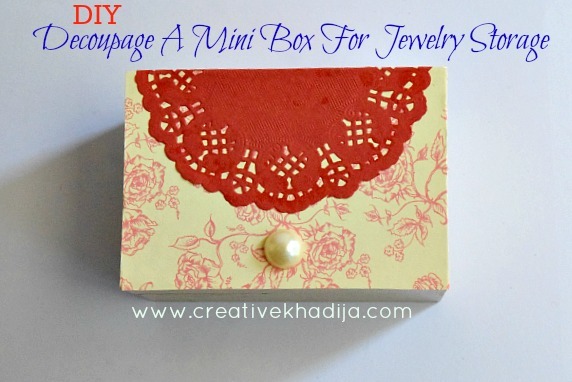 Thanks for linking up at Rhinestone Beagle! Come by and check out our “wanted” post, from sept 10th, for crafters like you to participate in out annual Howl-oween Craftathon. We’d love to have you join in. Thanks! sure I will be checking and participating! 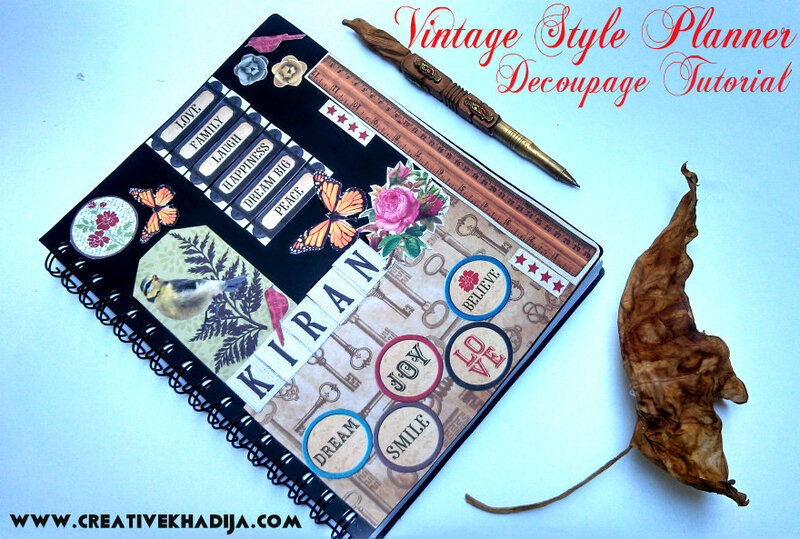 Very beautiful planner, Khadija! It does look vintage. I especially love the old keys and butterflies! Thanks a lot, the vintage style seems fun! Beautiful planner. The placement of each piece is just perfect. The picture of the sandalwood pen reminded me of the one I had years back. Great idea! We have piles of notebooks. My 13-year-old will enjoy making them pretty. Very pretty! I love journals and even more so when they are pretty!! That is absolutely beautiful. I love the colors that you used. Thanks, its easy idea indeed..sure try & show me then! Thank you Amy! its fun & pretty indeed. Thanks, fall inspiration is always fun! 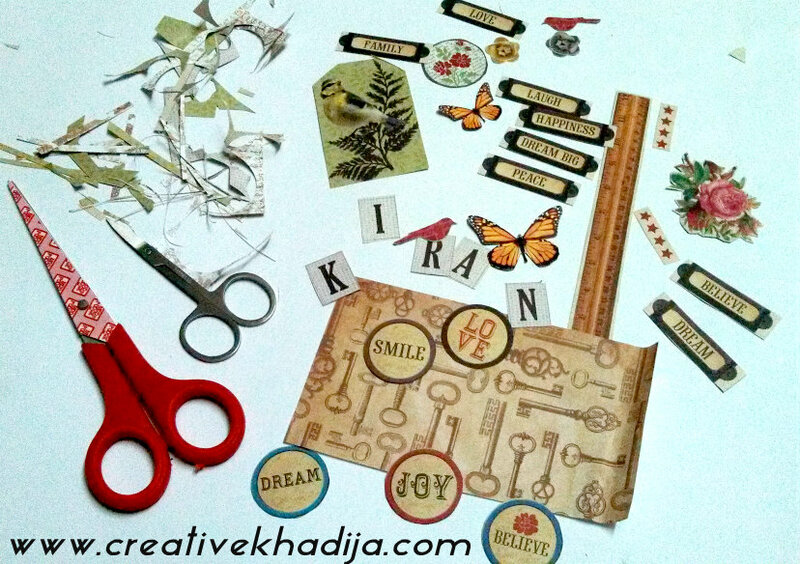 I love any kind of decoupage and/or collage project, and yours is lovely! Thanks for sharing it with us at Make It Monday! This is sooo amazing! I’m so bad with keeping a planner lately, but I do have a notebook where I jot everything down and I need to totally do this to it. Thanks for the creative inspiration! Decoupage is always interesting. Thanks for enjoying my work. Yeah the same thing was with me, But see I make it pretty with a little effort. 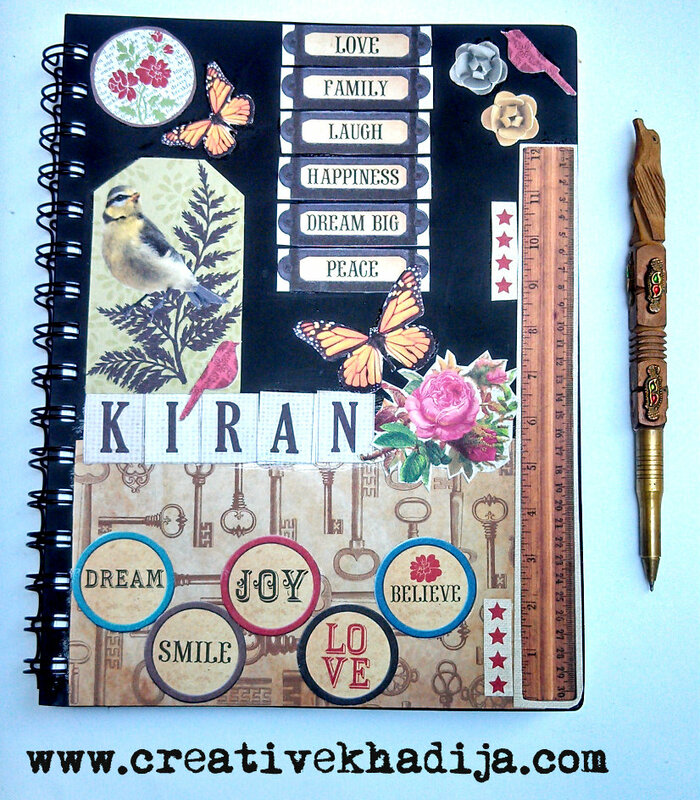 you should be designing yours journal now :) thanks for appreciating! Very nice, a great way to make a simple planner into something much more interesting and fun to look at. Thanks a lot for admiring my effort :) keep visiting! Очень красиво получилось! Спасибо за участие в! Thanks for appreciating! so nice of you ! Such a wonderful idea and so cute, too! Might just have to try one! Have a great week and thank you so much for sharing on Meandering Mondays! Thanks a lot for appreciating my idea :) sure give it a try! happy day! Very great post. I just stumbled upon your weblog and wished to say that I’ve truly loved browsing your weblog posts. In any case I’ll be subscribing in your rss feed and I am hoping you write again very soon!